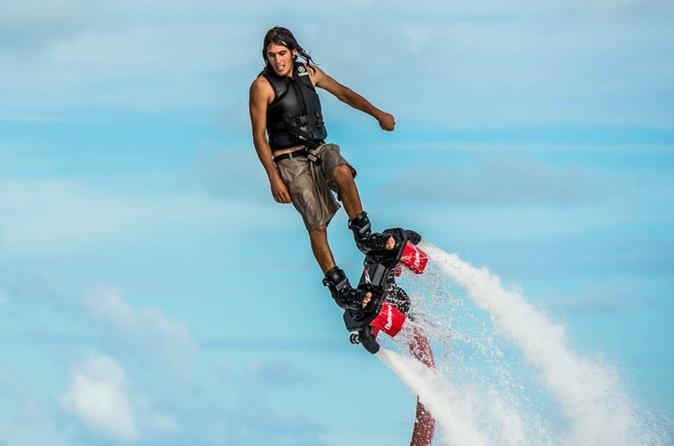 Soar over the beautiful waters of Miami during this exhilarating 30 minute Flyboard experience! Harness the power of water as your Flyboard launches you 30 feet above Biscayne Bay. Your professional instructor will provide in-depth training, and will hand the throttle over to you once you're ready. This is an experience like no other – the sensation of soaring through the air while taking in the scenery will absolutely thrill you. Your cruise departs from Miami’s Coconut Grove, where you’ll meet your certified instructor for a safety orientation and lesson. Riding a flyboard is safe and relatively easy to learn, requiring just a little balance and coordination. You can learn how to fly within minutes! Feel your adrenaline rush as you ride your water-powered flyboard over the beautiful turquoise waters of Biscayne Bay. Your instructor will be with you every step of the way, providing direct communication through a waterproof wireless coaching radio and fly-by wire throttle control. Once you have demonstrated balance and control over the flyboard, your instructor will turn control of the throttle over to you!